ChipMaster Operations -T1 | Welcome to A.P.E. no need to change these settings) Press and hold SET key until return to the operator screen. 4. Press up and down arrow at the sane time to reset timer to zero. 6. Turn on Vacuum, depress vacuum pickup until it contacts and holds the component. will count upwards along with the temperature on the display. turning off Vacuum and using tweezers to grasp component from vacuum cup. 10. For BGA: Remove all solder from pads using a soldering iron and solder wick, or solder braid, then clean well. For other SMDs: Use a soldering iron to add solder oaste to the pads equally and then clean well. brush to spread the flux over the area. 12. Place the component on the board, being very careful in the alignment to the pads. 13. Move the work beneath the nozzle, and center it. and the timer will be counting down. 15. 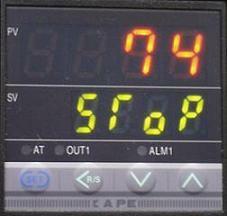 When the timer reaches zero, the machine will automatically begin dool down. Allow work to cool. will stop the machine operation.